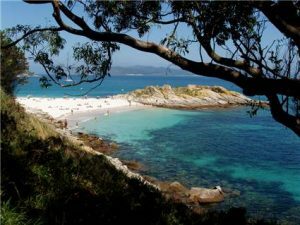 Las Islas Cies is a beautiful beach with the crystal blue water that gives you the best vacation in Spain. As the name reflects Las Islas Cies is an archipelago of three islands. It is situated on the coast of Pontevdra in Spain. These beaches are located on the Atlantic coast. 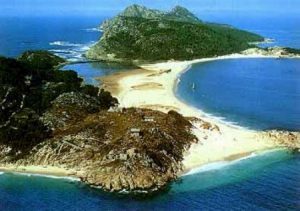 When you talk about the natural beauties Las Islas Cies definitely strikes to be on the top priorities. They display the complete picture of the beautiful and gorgeous creation of the nature. It is also known as “Saint Martin” and it is the southern island. It is known as the “Lighthouse Island” or “Isla do Medio” and it is the middle island. This is one of the most famous beaches of the world. This is considered to be the main beach where the people prefer to visit. This beach has its own importance due to the attraction it provides. It is also known as the Wheels beach. It has calm and crystal clear water. The sandy beaches and the pine forests enhance the beauty of this place. All these sites make it more attractive and the most desiring place to visit. It is approximately 300 meters long and is on the north of the island. It consists of fine sand on its coast. In summers it is open for the public. As this area is a part of national park so there are no bins for waste. So if you want to visit here be sure to take your debris with you back. If you are in mood to travel one of the best beaches in the world you must visit here. There are many supermarkets and little restaurants, serving their specialty which is delicious sea food. There are lots of visiting centers that provide various facilities to make your holiday life time memorable. The Idyllic campsite is the only place for accommodation. It is open from June to September and also during Easter. So, if you want to make your holiday special you must prefer this place. Make sure that you visit this beautiful place with your family during vacations. Seville Cathedral: The Pride Of Spain. Seville is one of the most exotic cities of Spain. With Moorish arches and colored tiles it becomes the most awaiting place. This place is considered as an exciting and modern European city. Seville city is the cultural center of Spain. The city is full of glorious history and numerous tales. The city has a decent and a stunning variety of lovely architecture. These abilities of Seville make it one of the most thrilling cities to visit. All the main sights are just at walking distance from each other. 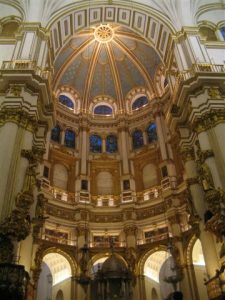 Seville Cathedral is the place where you can get the immense pleasure of spirituality. The entire environment is beautiful and magical. The cathedral took almost 100 years to complete. This tomb was initially constructed in the Cathedral of Havana but after the declaration of the independence of Cuba it was transfered to Seville. It is a room in the cathedral with precious sculptures and wall reliefs. Herman Ruiz Jimenez designed the main entrance of this room. The vault was completed by the Asensio de Maeda and Juan de Minjares. The construction of this tower was started by La Giralda and was completed in 1196. At the top of the tower there were four brightly polished copper spheres but they were destroyed by an earthquake in 1356. Later on the spheres were replaced by the cross and a bell. The cross and bell are the Christian religious symbols. This is a place inside the cathedral. It is also known as the Chapter room. The capitular lords used it as a resident area. A stone sculpture in the center enhances the beauty of the place. This place represents the glory of past. The Seville Cathedral is the place that has both the beauty and the tales of the ancient centuries. This cathedral is the best example of fine arts. The magnificent sculptures and the marvelous exteriors make this place worthy to visit. Make sure that you visit this marvelous place during your vacations. was basically erected as the preservation spot for the painting and sculptures but at present it has a number of drawings and prints. The place is a store for more than five thousand drawings and two thousand prints. You may also come at the spot where there are around thousand of coins and medals. The museum has a number of decorative items and the artifacts. The sculptures at this Spanish museum demonstrate more than seven hundred works and that too by the smaller number of the sculpture fragments. The collections of the paintings are about 7,800, but only thirteen hundred are kept for the public display. The prime reason to this is the lack of the space at this Spanish museum. A fresh and recently opened wing engorged the demonstration area of around four hundred artifacts. The museum is presently utilized for the everlasting and impermanent expositions. The El Prado Museum is the most visited sites in the capital city of Spain. It is supposed as the grand museum on the Spanish land. This is a reason for which the government of the country has rendered additional financial support to the museum. The museum is a store and a collection of about 1300 paintings that include the finest statues together with the attractive art form. The Prado is one of the best collections that this museum has and depicts the culture of Spain. Apart from the Prado there are other statues and paintings that include some of the leading artist and their creativity. Most of the art forms are from the works of a Dutch painter who is well renowned for his creative and elegant paintings. There are many of the ancient times paintings that give an insight about the Spanish culture and tradition. The Italian paintings is also am amazing feature that is eye catching and attractive. Thus visit the Prado museum for an entertaining as well as educational purposes. You will definitely feel pleasure and enjoy your trip to the full extent. Hope you have a joyful journey with your family and friends. coastal mobile dunes and the Mediterranean scrublands. This park was set up with the collaboration of the Spanish government and the World Wildlife Fund. It was originally opened in the year 1963 to promote the tourism of Spain. It is one of the greatest tourist attractions that are visited by millions of people every year. The entire park is full of natural beauty that the nature has bestowed on this park. You will be really amazed with its natural sightseeing apart from the wildlife. There are different types of rare species that are found in this park which consists of different varieties of Dolphins and fishes. You will also come across several plant species together with the colorful birds. The visitors are astonished over the stunning and attractive animals that are not found anywhere else. The eye catching attractions of this park are the camel that is worth seeing. The other species include the purple heron which are also an attracting attributes for the tourist. Apart from the vesting the wildlife you can also explore the large forest which is spread in several acres of land. The natural environment gives a soothing feeling to all the visitors who come to visit this park. There are many other things to enjoy like the nature and the greenery that is spread in an entire Donana national Park. Therefore it can be a perfect place for the tourist to discover something new and unique. If you love adventure and wish to enjoy your day then you do camping which is the favorite activity that is done by the tourist. The camping sites consists long area around the park so you have lots of more to explore. When you complete visiting the park then you go for finding the best accommodation for yourself. There are lots of options which can be easily found outside the park. The best way to reach the park is by hiring the car that can take you directly to the Donana National Park. Therefore the visitors can find the cheap and best viable option for themselves. Therefore visiting the park can surely be a thrilling experience which you will always cherish. are also wishing to have a great time in the lap of a perfect and majestic natural venue, then this article will really provide a great help to you. This article contains some of the tranquil and exotic features of the famous Parc Guell of Spain. This famous landmark is one of the best tourist destinations of Spain. We can say the most visited tourist spot of Spain Parc Guell is an exact replica of the garden complex. It is comprised up with a series of architectural elements and ornamentally designed rudiments. It is located in the Gracia district of the grand Barcelona city of Spain. It is sited on the top most part of the El Carmel hill of Barcelona city. The foundation for this garden complex was laid in the 20th century and it took about 14 years for the completion of this landmark. The construction of this Spanish landmark was started in 1900 and it was opened for the common public as well as the tourists on 1914. The exotic design of this monument was proposed by the famous Catalian architect Antony Gaudi who has designed more than 50 landmarks which are located in different parts of the world today. In the earlier times, this park was a part of the commercial housing site. The architectural design of this park is inspired by the famous English garden City Movement which is one of the major attractions of England. This park was recognized as the natural heritage site of the world by UNESCO. Today this park is one of the most well preserved monuments of Spain. The catchment area of this park is entailed with out of the ordinary craftsmanship and excellent architecture. The usage of unusual materials and designs is really very impressive. Now this park is being converted into a municipal garden. You can easily reach this garden with the help of underground railways, trams and city buses. The best time to visit this park is the autumn season when the temperature is quite moderate and the days are mild and long. The atmosphere is really very humid in the winters and the days are covered with fog and mist. The park is open for its visitors throughout the year. So, this was all about the Parc Guell of Barcelona which is very famous all around the world for its architecture. I am sure that you can make your vacations memorable by visiting this exotic landmark. option for you. Spain which is very famous for the ancient castles and monuments is the second most visited countries of the world. The historic palaces and castles which are sited in Spain are comprised up with several unrevealed facts behind the walls. Further in this article, we are going to discuss about the famous Alhambra Castle of Spain which is one of the ancient monuments and a perfect tourist attractions of Spain. Alhambra Castle was constructed in 711 AD. This ancient castle clearly highlights the Moorish architecture and the ancient culture of Spain. The Famous Alhambra Castle of Spain is sited on the hills of Sabika and it provides a very clear view of the grand city of Granada. UNESCO has also recognized the ancient Alhambra Castle as the world heritage site. This ancient castle which is completely enhanced up with the primeval culture of the earlier times is one of the major attractions for the tourists of Spain. This prehistoric castle is one of the most well preserved heritages of Spain. The Alhambra Castle of Spain occupies a hilly terrace on the hills of Sabika. The superseding and paramount tickle of water drops is the first impression of the Alhambra Castle on the minds of its visitors. This ancient castle is build up in the very arid spot and it is no more than an authentic park of water features. This antique and primordial castle of Spain used to be the residence of the Muslim rulers of Granada in the earlier times. The ancient and magnificent walls of the Alhambra Castle are engraved with the historic tales of the earlier Granada. The whole castle is comprised up with the antique and bravura architectural skills of the earlier period. The exotic Alhambra Castle of Spain constitutes of three parts: the lion court, the Serello and the Harem. This castle has also been the witness for the execution of many of the Muslim rulers of the renaissance era. The lion court which is sited at the centre of the castle is one of the most visited and photographed site of this castle for the visitors. It is one of the greatest examples of the Muslim architecture. This castle is really a mesmerizing place to be visited in Spain. Make sure that you make your vacations memorable and have fun at this gripping holiday attraction.